Back to Basics: the camera’s internal light meter and metering modes – what landscape photographers need to know. If you are at all like me, then your camera’s light metering mode – or simply ‘metering mode’ – is not something that occupies a lot of mental capacity while taking photographs. In fact, I’m not sure that I have ever changed the metering mode on my present camera. Be that as it may, metering mode apathy is not something that I endorse. Despite often being overlooked, metering modes are a foundational aspect of present-day photography and must be understood before embarking on more elaborate exposure strategies. A vintage light meter with aperture and shutter speed marking visible on the dial. In the not too distant past, photographers wishing to capture correctly exposed images had to rely on either blind luck or, alternatively, handheld light meters. By using light meters, they could establish which combination of aperture, shutter speed and ISO would result in a correctly exposed photo. By all accounts, the handheld system worked well, though I suspect that the need to whip out a light meter before every shot meant, rather annoyingly, that many of the more fleeting photographic opportunities went undocumented. In an effort to speed up the photographic process (and, I’m sure, to alleviate some of the tedium associated with constantly having to meter), advancements in camera technology saw light meters being integrated into the camera body itself. These meters could not only evaluate the current lighting conditions but could also make real-time adjustments to a camera’s aperture, shutter speed and ISO settings. While this step forward in camera technology was, without doubt, an enormous one for photography as a whole, even today, the photographic wizardry involved with the internal meter is not without its flaws. The biggest problem with internal metering is that the camera and the subject of a given photograph can never be in the same place at the same time. 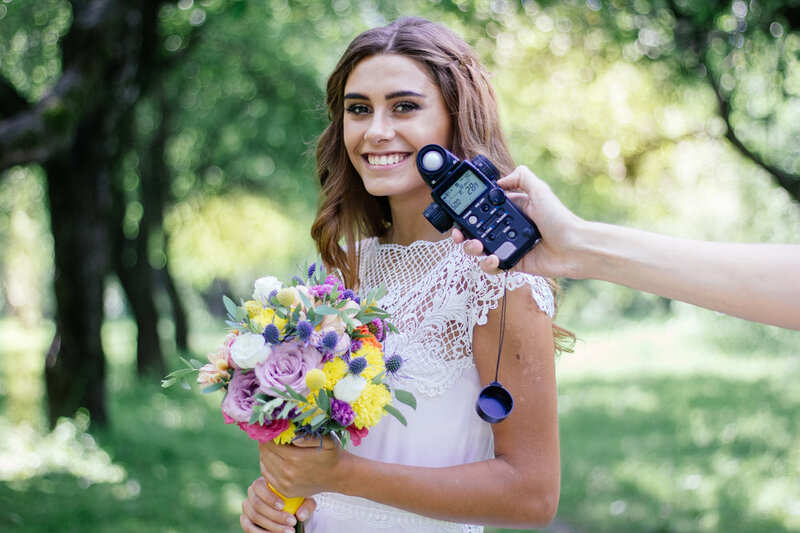 When using a handheld light meter, for instance, it is common practice to hold the meter in precisely the same location as the subject so as to exactly calculate exposure values that will correctly expose said subject. The values calculated by the light meter are then manually inputted into the camera at its location so, despite the camera and the subject being separate from one another, the photos reproduce perfectly. Model having the light at her exact location assessed using a handheld light meter. Internal light meters, by contrast, have no choice but to attempt a similar light assessment to a handheld device, except from a distance. The subject is in one position while the camera is in another and yet the internal meter is expected to determine the subject’s lighting requirements. To be fair, internal light meters are able to make these sorts of assessments provided that a subject accounts for a large part of the scene. Problems arise when a subject only makes up a small portion of a frame as there is simply no way to indicate to the camera precisely which part of a scene represents the subject. The smaller the subject becomes in the frame, the less likely the camera is to get its metering calculations correct. In fact, the best that any camera can do is to evaluate the scene as a whole (foreground, background and any subject) and, based on the metering mode selected by the user, to make an educated guess at what the correct exposure setting ought to be. Metering modes exist to give photographers some authority over what gets metered in a scene and what doesn’t. The trouble is that even with the existence of metering modes, the native metering capabilities of cameras are incredibly limited. The majority of cameras feature just four metering modes: Spot metering, Partial metering, Centre-weighted average metering and Evaluative metering, with the specific details of these individual metering modes varying from camera to camera. The typical metering modes and the related camera symbol. All these metering modes compute exposure values based on the light present in the centre of the frame, with the primary difference between one camera and another being how much of that frame is used when making an assessment. Most DSLR cameras, for example, have meters that are only capable of evaluating the area of a scene that happens to fall within the bounds of the camera’s focal points. An illustration of a viewfinder showing how much of the frame is covered by the light meter. The grid pattern denotes the metered area and the 61 smallest squares the focal points. The centre circle shows the region encompassed by the Partial metering mode. Spot metering – Evaluates only the very centre of the image and covers just 1.5% of the total viewfinder area. Partial metering – Also evaluates only the very centre of the image, but coverage is increased to 6.2% of the viewfinder area. Centre-weighted average metering – Uses the entire measurable area but prioritises the centre of the frame. Evaluative metering – Uses the entire measurable area and a proprietary algorithm to arrive at the final exposure values. To help photographer’s cope with the intrinsic limitations of the internal light meter, cameras today feature two additional tools designed to assist with getting the task done correctly: AE lock (auto-exposure lock) and exposure compensation. AE lock lets a user train the camera’s metering system onto a subject and to lock the resulting exposure settings into the camera. Locking the exposure values permits the photographer the freedom to then recompose their image while the subject‑appropriate settings are maintained. Exposure compensation, by comparison, provides a facility for the camera’s metered setting to be adjusted by dialling in an exposure compensation value (read more about the details of exposure compensation here). If you enjoyed this article, then please give it a like or leave a comment below! The four basic exposure strategies. Back to Basics: What is the difference between zoom lenses and prime lenses?